Force blurs the lines between contemporary music production solutions and the latest technologies available for DJ performance, a first among the industry standards. By merging clip triggering, step-sequencing, sampling, but also in-house synthesis engines, not to mention the latest-generation touchscreen, all in one stand-alone performance equipment, the Force combines the essential features to offer ultra-intuitive ergonomics and allow you to give free rein to your creativity. 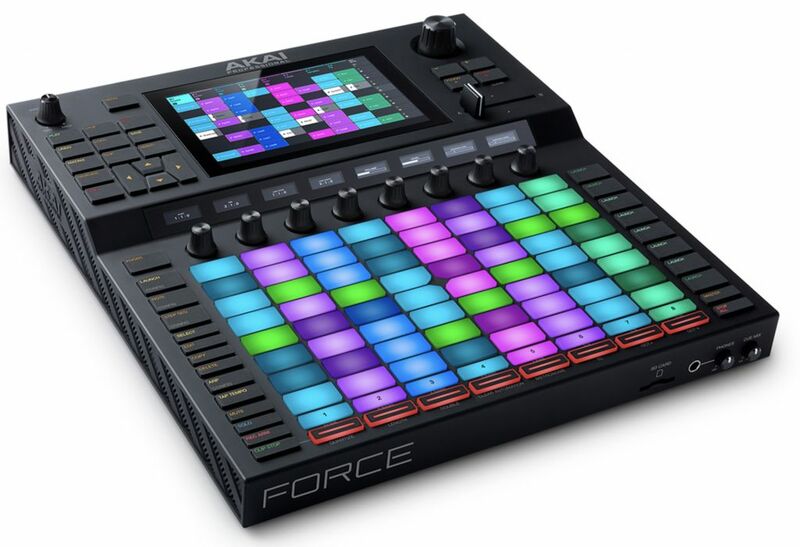 Force embeds a matrix of 8x8 trigger pads with RGB backlight, a 7-inch color touch screen, 8 touch-sensitive potentiometers with individual graphic OLed display, 2 audio inputs, 4 audio outputs, not to mention the MIDI and CV Gate connectivity . All this end to end leaves the user unprecedented creative freedom, since it even goes to emancipate a complementary computer. The very essence of Force consists of a workflow focused on the use of the clips, which are at the origin of your creative performances. Choose multiple modes such as plugins, MPC-style drum tracks, but also audio tracks, Keygroups, MIDI tracks, and CV tracks to set your clip type, then customize them with step sequencer and performance pads , and add notes via the edit window or the smart-scales, chords or progressions modes. In addition, Force has advanced real-time timestrech capabilities and pitch modulation with quality equivalent to current music production software, effects plug-in from AIR Music Technology collections, and TubeSynth synthesis engines. , Bassline and Electric. Another synth, Hype, extends this list, a synth based on presets and macros accumulating several synthesis engines in one plugin, easy to use. Force can also record up to 8 stereo audio tracks. Force includes more than 10GB of embedded sounds, from the most famous collections of premium content like SampleTools by CR2, MSX Audio and Sample Magic. With 248 kits, 16 demo projects, more than 2,500 loops and 500 designs, the Force library opens the doors to the best sounds for your creativity. As of March 2019, Force will also include deep integration with Ableton Live in controller mode. This feature will include visibility and full control over the Ableton clip array, touch control of mix parameters including crossfader assignment, and control of Force settings on the Ableton Live workspace, via the screen. Touch and Force Q-Link knobs. In addition, March 2019 will also mark the integration of Splice into Force. Splice Sounds powers the creativity of producers around the world with access to millions of high-quality, royalty-free samples, sounds, presets and loops, covering almost every genre of music. With the integration of Splice, Force users will have immediate Wi-Fi access to their own Splice library directly from the touch user interface - perfect for ultra-fast auditioning of sounds to be integrated into their project. Wow... could be a really cool thing but that price puts it beyond even elektron boxes. Looks like you could play some variation of Tetris on it. Clearly a few steps up from the MPC Live. At that time is was named the APC Live. The folks at DJTech Tools leaked it first, I believe. This looks pretty nice. I have both the Akai APC40MkII and the Ableton Push (not the "2", just the "Push"). Those seem pretty nice. So ... yea, whatever. 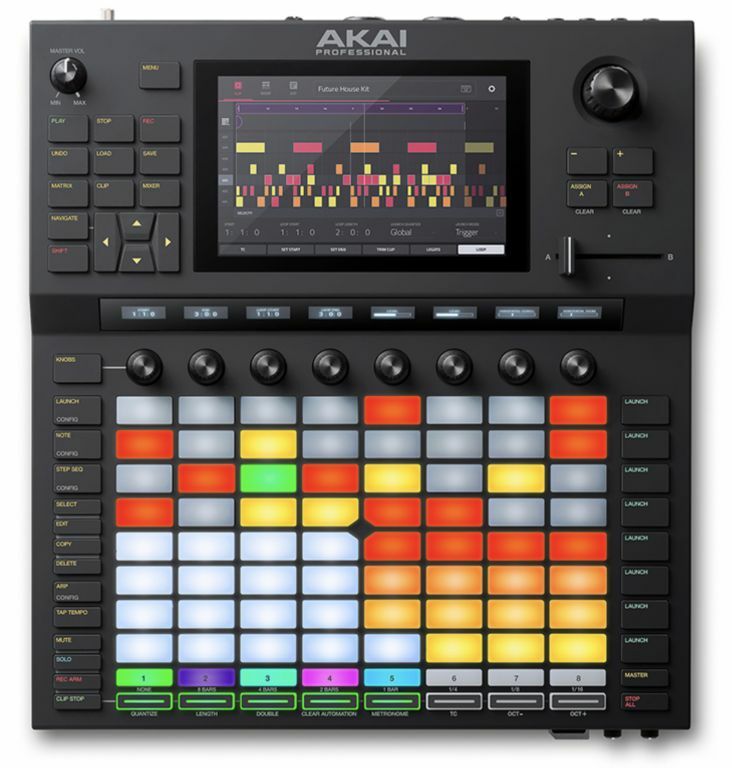 And now we have this ..... named the Akai APC Live. This thing is supposed to be some sort of stand alone .. as in ~no computer required~ .. combination of the Ableton Push2, the Akai APC40MkII, and the Akai MPC Live. I've no clue on the munnies. 16 gig storage, and ten of it pre-loaded; but at least it is expandable. Just add peripherals. I wonder if the screen always mirrors the clip matrix? Seems redundant if so. It would be better if the screen had text labels to pinch and zoom in on, for those who forget what color the next clip is supposed to be. That's what Ableton does. And display menu screens for EFX, filters, etc. Maybe they've thought of all that? I think this looks pretty cool and potentially useful. Enough connectivity to make it a good live hub. It would be cool if it had MPE midi. I think US price is going to be around $1425 (No VAT euros to dollars), a little steep but comparable to newer Elektron boxes. I don’t see myself buying one new but I could see myself watching for one on the used market - unless there is just some dealbreaker for me. Depending on how this looks at NAMM, I may consider getting rid of my MPC X for this. I am guessing they are stereo outputs with option for mono splitting. Given they have opted for midi on minijack it seems this space saving solution could be in play. Make it bigger? I understand at least 8 outs isn't important for a lot of people but it is for me. CDM is reporting the US price as $1499 USD. I wouldn't need more than the 2 ins and 4 outs for a "DAW in a box", personally. Though I understand why some people would. Things learned from the video series: 4 FX sends, The FX returns can have a chain of 4 different FX. Additionally, there are 4 insert FX per track. Outs 1/2 and 3/4 can have their own independent 4 insert FX as well. could be very interesting to add this box to a modular to catch loops or oneshot samples ( working Hardware only vs. ITB). depends "for me" totally how good the whole "record on the fly etc. etc. " workflow is. yeah, looks like MPC/X technology repacked and rearranged. Exactly. "Quantized" or synced recording/sampling would make or break this thing for me. Definitely this. For me, it MUST sync/slave to MIDI clock... has to. Looks interesting, but I'm adopting a wait and see attitude for now. Wish it had more I/O. 8in/8out would of been way better. Definitely this. For me, it MUST sync/slave to MIDI clock... has to. Akai, are you listening ? D............, but I'm adopting a wait and see attitude for now. It does have a WAY better screen and what, 6x the light up buttons of a RYTM? Plus still had the crossfader. I think this thing looks pretty cool, as a way to perform /remix your own stems. Honestly I thought the Pioneer DJS 1000 looked pretty cool too, but their Nexus 2 ecosystem is just absurdly expensive, and it only works in conjunction with that. I'm curiously interested in this unit. Looks pretty well featured at face value. IMO, putting the MIDI on mini jacks for a product that is supposed to be the centerpiece of a live performance rig is a bad choice.